Gary Rogers; Sean Gannon, Brian Gartland, Andy Boyle, Dane Massey; Richie Towell, Stephen O'Donnell; John Mountney, Ronan Finn (Chris Shields 58), Daryl Horgan (Darren Meenan 89); David McMillan (Sean Maguire 85). Brendan Clarke; Lee Desmond, Sean Hoare, Shane McEleney, Ian Bermingham; James Chambers, Greg Bolger (Jason McGuinness HT), Chris Forrester; Conan Byrne, Aaron Greene; Jamie McGrath (Darragh Markey 66). Dundalk moved ten points clear of the chasing pack after a ruthless display of attacking football saw Stephen Kenny's side run out 4-1 winners against St Patrick's Athletic at Oriel Park. The result, coupled with Cork City's 3-0 defeat in Tallaght, means that the Lilywhites are red-hot favourites to go on and complete back-to-back titles for the first time in the club's history. Now 12 points adrift, the result kills off any lingering hopes that Pat's had of mounting a late title charge. 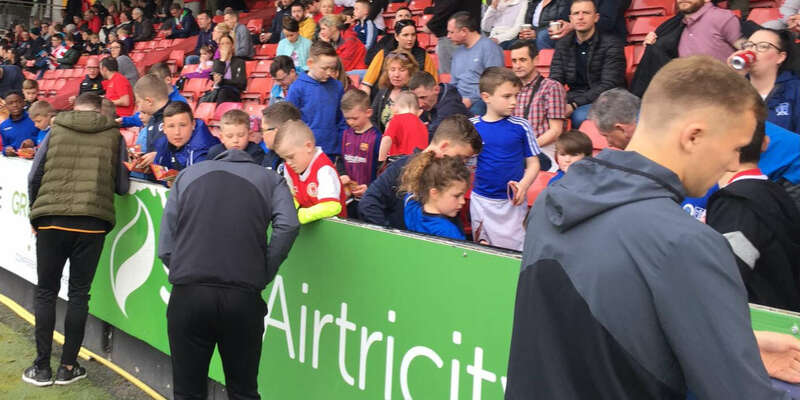 Liam Buckley's side arrived looking to register their tenth straight league win but instead they fell to their fourth defeat in all competitions against Dundalk this season. 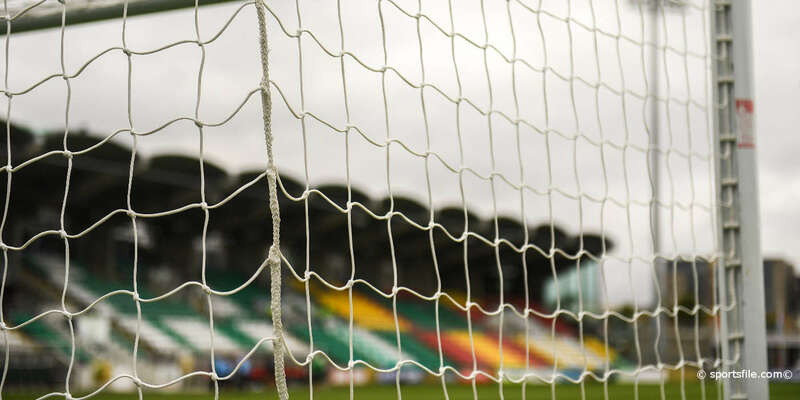 Kenny was unable to call on the services of Ciaran Kilduff as the striker signed from Pat's three weeks ago but both clubs agreed that he would not feature in this clash. Buckley had to make do without the suspended pair of Killian Brennan and Morgan Langley, but Ian Bermingham returned to skipper the side. Dundalk signalled their intent after just 30 seconds. David McMillan worked space on the left of the St Pat's penalty area to pick out Richie Towell but his first-time volley posed no danger to Brendan Clarke. The breakthrough arrived in the sixth minute from a familiar route. Daryl Horgan's corner from the left was met by Brian Gartland and he thumped a header past Clarke to give Kenny's side the ideal start. It was almost 2-0 just five minutes later. Slick play between John Mountney and Ronan Finn on the right ended with McMillan flashing a header just past Clarke's left hand post. The natives continued to display a real cutting edge and their pressure told again in the 13th minute. A beautiful passage of play ended with Finn slipping McMillan in behind the Pat's back four and he made no mistake. Kenny's title chasers showed no let up and the influential Finn was unlucky to see a ferocious half-volley fly just wide in the 19th minute. 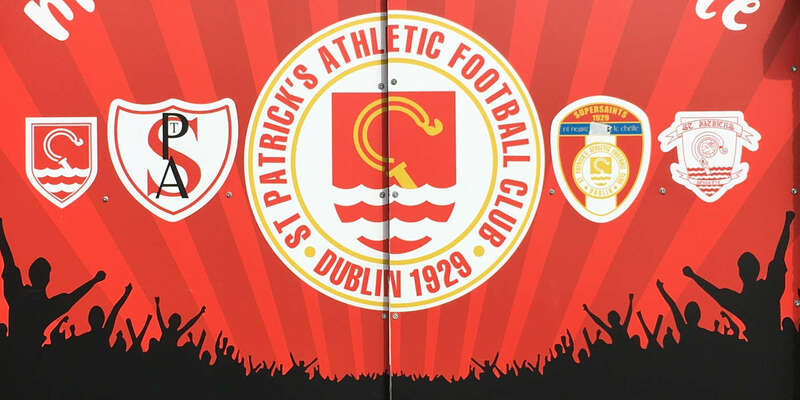 St Pat's eventually stemmed the tide and Gartland's nudge on Jamie McGrath gave them a free-kick in a dangerous position in the 29th minute. Conan Byrne's effort hit the wall but when Sean Gannon cleared the ball back into James Chambers's path, the hosts were relieved to see the ball whistle just past the upright with Gary Rogers well beaten. Any hopes of a comeback looked to have gone up in smoke two minutes later. Daryl Horgan's pass steered McMillan to the left of the penalty area but the former Saints striker rifled a fine drive across Clarke to take his tally to 11 for the season. The goals continued to rain down and Chambers pulled one back in the 38th minute when he bent a free-kick around the wall to beat Rogers at his near post. It was an effort that the Dundalk goalkeeper should perhaps have dealt with. Dundalk restored their three-goal cushion going into the break. Greg Bolger easily gave the ball up in a dangerous area, allowing Finn to drive towards the penalty area and roll the ball across the face of goal for Daryl Horgan to tap home. Buckley reacted to his side's inept first-half display by replacing Bolger with Jason McGuinness at the break and Pat's emerged for the second half looking much more assured. Conan Byrne forced a save from Rogers after cutting in from the right before Aaron Greene saw a shot deflected just over the top. There has been no love lost between both sets of players in recent years and the handbags were produced in the 65th minute with both Towell and Chris Forrester booked for an altercation after Jamie McGrath was left flattened by a stray boot from the Dundalk midfielder. Rogers atoned for his earlier mistake by clawing another Chambers free-kick away for a corner in the 74th minute before Greene directed a neat effort just wide. Dundalk, however, saw the game out to take a huge step towards the club's 11th league title.